Boise, Idaho USA (November 25, 2014) - Supported Rekluse riders earned 16 professional World and National AMA Championships for 2014. Motorsports racing demands strength, endurance and smart decisions. Athletes that exemplify these traits and use the best equipment available are crowned Champions. Rekluse clutch products are engineered and manufactured 100% in the USA to help deliver championship performance for all riders. Factory Beta/Stillwell Performance Team rider, Cody Webb, won his first Endurocross Championship dethroning the 5 time consecutive Champion. It was a hard-fought Championship Series this year with very close points spread up until the final round. Webb also won the AMA Kenda Tennesse Knockout Championship Title this year. Riding for Factory FMF/KTM Offroad Kailub Russell had a tremendous season, landing him in the top spot with 9 wins of the 13 round series. With 8 wins of the 13 round series the young racer put in an outstanding 2014 performance aboard is Factory FMF/KTM Offroad machine. Factory FMF/KTM Offroad Team rider, Kacy Martinez, lead the entire series with 9 wins out of 13 races, earning her first career GNCC Championship. Jolly Racing team rider, Alex Salvini, secured his 2nd consecutive Italian Pro Championship just before injury plagued his shot at a repeat EWC Championship. Long time AmPro Yamaha team rider and 6 time OMA Champion, Paul Whibley, reclaims his reign as the 2014 OMA Champion with a strong race season. Riding for the Royal Distributing/FOX Head KTM Canada Motocross team, Kaven Benoit put in a very consistent season netting the overall championship title. Taking his first career National Enduro Championship Title, Andrew Delong raced his Factory Husqvarna Offroad machine to the winner's circle with consistent finishes and very strong rides. AmPro Yamaha/Raines Riding team racer, Jed Haines, battled his way to the top spot in the East Hare Scrambles Series earning the well-deserved championship. Riding for Factory Husqvarna Offroad, Jacob Argubright was able to earn his first ever career National Championship Title one round early. With an 80% podium appearance Gary Sutherlin was able to take home his first career WORCS Championship Title. Riding for Traders Racing Kawasaki, Tony Archer won his first career Championship Title this year with consistent performances throughout the 9 round Arenacross Series. Securing her third EWC Championship Title with 6 overall victories, Laia Sanz continued to dominate the women's class aboard her Team KH-7 Honda CRF450. The Baono Beta team rider, Daniel McCanney, clinched the 2014 EWC Championship Title. McCanney is also the 2013 SuperEnduro Jr Champion and this new title makes him the second rider to have ever won in both disciplines. Riding for the Rigo Racing team aboard a Suzuki RMZ-450, Maurizio Micheluz secured the 2014 European Enduro Championship Title. Previously, Micheluz has won the 2011 and 2012 E3 Championship Titles. After spending over $500 on a set of Fluidyne oversize radiators I figure I needed some guards to protect my investment. Regular guards that fit stock radiators may not fit these oversize units. 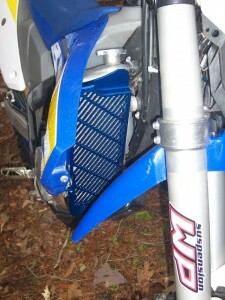 Bullet Proof Designs make a solid billet guard for these radiators. The quality of these guards are amazing. No more putting together a bunch of pieces to make a guard here. It starts of as a solid block of billet and CNC to the shape needed. Since there is no aluminum that is bent to shape this guard is much stronger than all the competitors. Mounting these are as simple as removing the plastic scoops and the two bolts that hold the radiator against the frame. The guard snaps in front of the radiator and uses the stock mounting holes to hold the entire unit together. This gives your front and side protections. 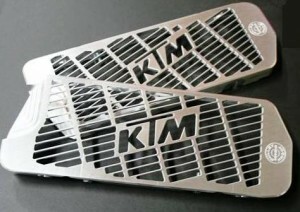 This also allows you to keep the KTM fan kit in place. The Plastic scoops bolts back on like stock. These guards are not cheap, starting at $229.95 and going up with options like adding logos or anodizing, but are way cheaper than buying new radiators. I’ve had these on my bike for over two years now and I crash a lot. Not once have these allow any damage to my expensive radiators. 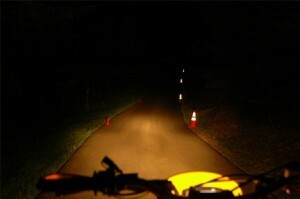 I always like having a light on my dirt bike since the first time I've tried night riding. I've tried most of them and currently using the Trail Tech X2. This light comes in variety of different configuration. Halogen, D.O.T. Legal, HID and is available in 7 different colours. Included in an attractive plastic shell is one 2″ SCMR16 and a 4″ SC4 lamp. The 2″ projects a spot beams for distance illumination and the 4″ lamp shines up close. The light I am using is the HID version. At $324.95 it is not cheap and you will also have to modify your electrical system to run it. HID requires DC voltage so a regulator rectifier is required and on some bikes a new high output stator. Trail Tech makes plug and play electrical system that takes all the guess work out of running a high power light system like this one. A plastic shield is available to protect the glass lens for $14.95. Putting one on is a snap if you own a KTM like I do. 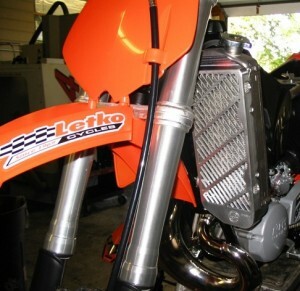 The bottom of the light has two holes for the the alignment post built into KTM fenders. 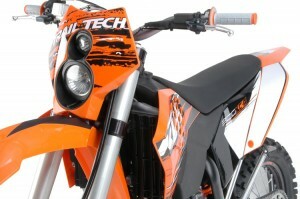 If you don’t have a KTM, Trail Tech supplies a post that is installed between the front fender and the lower triple clamp. There are two rubber straps near the top that wraps around the fork tube to secure the light. Wiring is a simple three wire hook up. Ground, low and high beam. You can order a model specific light that will plug into your stock harness but on the HID version they are not available. I used the Trail Tech electrical system and just followed the well detail instructions. 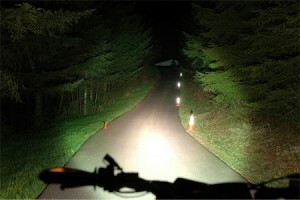 HID lights are known for there bright white light. They generally are 4 times brighter then halogen of equal wattage. This light has two 35 watts lights making for one bright light. One feature of HID is a slow start up. The light starts very dim and then gets brighter and brighter till it’s at full power. This usually takes around 5 seconds. Not a big deal but I have my light wired so I can switch from my sport to flood beam and when they switch my light goes dark for a second. Really unnerving when it’s pitch black out. The light output is very good for slow trail riding. As your speed picks up in open areas you can out-ride the light but you are really flying when this happens. I supplement my headlight with Trails Tech’s LED Helmet light so I can usually ride at any speed with this combo. This bike doesn't have rim locks because it’s a dual sport, but removing a tire with a rim lock is the same. If you like to see how to install a wheel with a rim lock check my “Installing Dirt Bike Tires On New Wheels” post.